The on-demand economy is heating up at an immeasurable pace and the influential effects of this augmentation will be experienced in just about every business. The on-demand economy not only changes the way people consuming it but also it has changed the work culture of millions of people across the world. This new economy empowers transportation industries to on-demand self-service portals with its ﬂexibility and stunning ease-of-entry. • 1 in 5 people come to the on-demand economy for work because they have fallen on financial hardship. • 41% of workers in this industry are female. • The average age of an on-demand worker is 40. • 64% are white; 11% are black; 10% are Hispanic; 7% are Asian; 9% identify otherwise. • 41% of on-demand workers have either traditional full-time or part-time work. • 48% say that working on-demand gigs helps them to maintain their financial position rather than improve it. • 90% of workers love the freedom on determining their schedule and the way they work; only 50% are highly satisfied with this setup in practice. 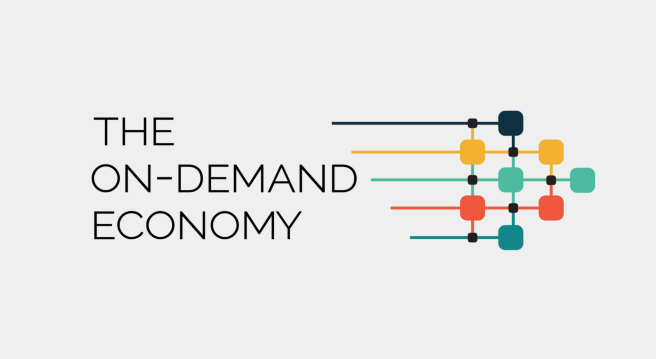 The report clearly says that on-demand economy has turned positively in the recent years and it transformed many traditional workers into this new economy because of affording enough hours to work. Another 29% of employees in this economy to achieve a medical expense. The results were influenced to reflect the dimension of workers in each of the following segments: Drivers/Delivery, Online Talent Marketplaces, and Field Service/Onsite Talent. Respondents of the on-demand economy workers are comparatively more than other industries.